I have a soft spot when it comes to low budget horror. While this website is mostly dedicated to b-horror, cult, exploitation, foreign and what have you, it's also a place where small budgeted horror flicks can be noticed, good or bad. If you're out there trying to put your name on the horror world, this is the place to promote your work. I can't promise I'll love the movie, but I'll definitely give it as fair a viewing as I would Scream 4. Patrick Horvath's DIEner aka Die-ner (Get It?) 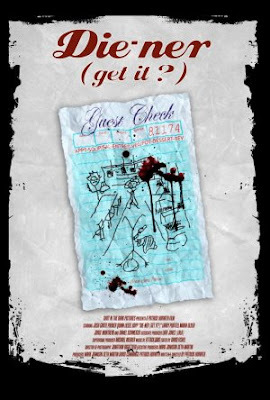 is a welcomed addition to the shoestring budget genre. While it may not be the best horror film out there, it's definitely a great start for the director and has a steady charm to it that you would expect to find in a late night Cinemax horror flick. 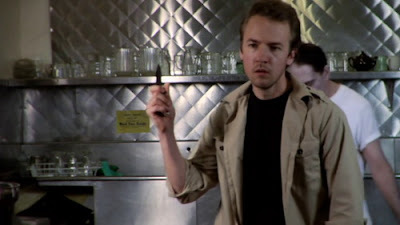 Ken (Joshua Grote) is a serial killer. We learn this in the first few minutes of the film. What makes him interesting is that he's very personable and almost friendly if you look at him in the right light. Stopping at a desolate highway diner, Ken allows a waitress to pour out her woes on him and gives her a friendly shoulder to lean on before swiftly dispatching both her and the cook. Soon after, a married couple on the rocks stop by the diner to mull over their demised relationship while Ken pretends to be a waiter working his first night. Ken tries to give them the same friendly chit-chat, but our couple, Rob and Kathy, request that they be left in peace to finish their conversation. Now, bumbling lawman Sheriff Duke has come into the diner and is wondering where his regular waitress is and why the cook isn't in the kitchen. When Ken pretends to check up on them, he finds that his recent victims have become zombies and enlists the help of the diner patrons to help him restrain them. Soon, Sheriff Duke has been bitten and Rob and Kathy have become Ken's hostages while he tries to figure out how to handle the increasing zombie attack on the diner. While you may be thinking "Oh great, another zombie film..." like I was, I have to stress that it isn't an overwhelming rehashing that we're used to. DIEner is more of a slow and quirky character study a la Dead & Breakfast, with humor, lots of conversation, and likeable protagonists. In some ways, the film could have probably gone in another direction without the zombie plot line, but it serves as an exaggeration to a bad situation gone horrible. The acting in the film is one of the things you'll probably notice first. It's not bad. It's not bad at all. Ken looks like he could be Edward Norton's b-horror twin brother, giving off the same friendly tone and mannerisms that Norton does, as well as his controlled anger. Rose (Maria Olsen), our waitress from the beginning, also gives a great performance before she's turned into a zombie, spilling out her hopes and dreams for a guy she's never met, but has no one else to talk to in this remote area (or probably no one interested in even talking to her). Rob and Kathy (Parker Quinn and Liesel Kopp, respectively) are great as the bitter married couple trying to cope with a zombie attack on top of figuring out if they're going to divorce, and finally, Sheriff Duke's monologue about the happiest/saddest moment in his life, is both poignant and heartbreaking in a darkly funny way. The film has plenty of gore for the horror fans, most of it comically planned, with severed fingers, decapitations, and a "I regret nothing!" moment that pays homage to Romero's Day of the Dead. The film makes good use of its low budget with clever camera shots to enhance the gorier moments, and even feature some pretty decent prosthetics that are better than some larger budget b-horror films out there. Like a lot of low budget films, it suffers from a few stiff shots, some scenes that drag on a little too long, and a lack of other locations that can get boring at times. It also features these lovely little flashback dream sequences that unfortunately are never fully explained. But aside from these things, DIEner is a funny, well acted, gory cut above the rest. The film is currently available on Netflix Instant in the US. I would definitely recommend checking it out!